Tea and scones go together like milk and cookies. One is just simply more enjoyable in the company of the other. Taking it one step further, I decided to meld the two together by flavoring my favorite scone recipe with tea. Masala chai tea offers the perfect balance of aromatic spices that can be imparted to dough through a cold infusion technique. With notes of cardamom, clove, cinnamon, ginger and black pepper, there is absolutely no need to open the spice cabinet or fiddle with many measuring spoons for this recipe. Those holiday flavors you are trending toward this cool weather season are available, conveniently packaged in an environmentally friendly canister, in Organic Masala Chai Black Tea from Arbor Teas. While the ingredients come together quickly, you will need to plan ahead to let the cream steep. The longer the tea infuses the more pronounced the masala chai spices will be. Butter and cream make these scones rich and moist, while cake flour lends a tender, crumbly texture. Combine heavy cream and masala chai tea in an airtight container and refrigerate overnight or up to 24 hours. When ready to make scones, preheat oven to 375°F. Strain the cream to remove the tea, pressing with a wooden spoon to recover as much as possible. Whisk together flour, sugar, baking powder, and salt in a large bowl. Toss butter pieces into flour, blending with your fingertips until the mixture resembles a coarse meal. (A few pulses in a large capacity food processor will make short work of this.) Stir in dried currents. In a separate bowl, mix together egg and 1 cup masala chai-infused cream, then gently fold this into flour mixture until the dough just comes together. (It will be quite delicate.) Turn dough out on a lightly floured surface, and with floured hands shape into a 1-inch thick rectangle. Use a knife to cut out small triangles of dough and arrange 2 inches apart on a parchment-lined baking sheet. Brush tops of scones with remaining cream and sprinkle lightly with sugar. 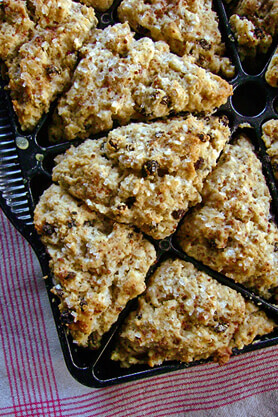 Bake scones until tops are golden, 25-30 minutes. Cool slightly before serving.